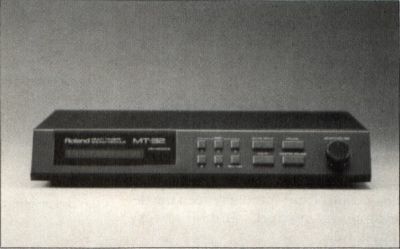 Roland MT-32 Multi-Timbre Sound Module. Michael Friesen has worked as a bookbinder, a chicken shed cleaner, a cow milker, a ditch digger, a jingle composer and a synthesist for a touring theatre company. He's now a full-time journalism student at the University of Western Ontario. When Roland introduced its D-50 synthesizer, it was priced for the full professional, not for regular mortals on limited incomes. In what has become a company tradition, Roland introduced an abbreviated version of the same technology for the home market. Dubbed the MT-32, company officials were surprised when semipros started gobbling up the units. They shouldn't have been. After all, here was a module with D-50-type sounds, multitimbral operation and a bevy of drum samples thrown in for good measure. Priced at approximately $700, the unit sold unexpectedly well to musicians who needed high performance on a low budget. Apart from a host of great features, buyers also got what must be the oddest operating system quirk in recent synth history. The MT-32 is a small black box with an external power supply. The adapter is justified in the portability it lends to the unit. How portable is it? Extremely. With the exception of the cheaper and considerably less-powerful Yamaha FB-01, this is probably the lightest synth around. With a footprint the size of this page, and about two inches high, it's hardly a wonder that this is a favorite demo box at the trade shows. The back panel has two ¼-inch output jacks, along with MIDI In, Out and Through. There's also a barrel-type power jack. Putting the on/off switch here was a good idea, considering how easy it would be to accidentally hit it while making front panel adjustments. The front panel features a 16-character, backlit LCD display, six channel-select buttons and a rotary pot for selecting sounds and setting volumes. The LCD is informative and quite readable under most lighting conditions. Unfortunately, you have to be facing it straight on for maximum visibility. There is no contrast control. The six channel-select buttons can be used to examine what patch and volume are selected on each of the eight channels plus the rhythm channel. Six buttons for nine channels? Well, yes. You get to Channels 6 through 8 by holding down the Master button plus the selector for Channels 1,2 or 3. Which brings me to a minor gripe. Although the MT-32 allows the user to set a good array of features from the front panel (including an "all notes off" switch), you need either a good memory or a hand-made template to remember that hitting MASTER + PART 4 allows you to turn on the Overflow Assign function. Along with voice and volume settings for all nine channels, you can modify reverb decay time. It's handy, but you have to set it manually every time you turn on the machine. It defaults to a the medium-hall program with a moderate decay time. Until you get one of the many computer-based editors, you'll have to live with the presets. It's not too hard to do. The 128 preset sounds are warm, with good transients on the critical attack phase. Because the unit uses all-digital circuitry in the synthesis process, though, even the warm sounds can't touch the richness of some of my old Juno 106 patches. Some of the presets suffer from sloppy programming. Syn Brass1 is one of several sounds that, when pushed to maximum velocity, will overdrive the digital to analog converters. The result is a crackling that won't go away until you drop the output volume to about 70. Some of the sounds are pretty bad. In the tradition of L/A synthesis, there isn't a good piano anywhere in the circuitry. The synth basses, the brasses and strings are somehow thin and uninteresting. So what does that leave? Lots of great stuff. All of the organs sound great (a local pastor tried to convert me after hearing Pipe Org 1), the synth brasses are vibrant, the saxes and basses approach the real thing, and some of the other sounds in the Synth banks are absolutely amazing. I must also note the Sho-No-Fue patch in the Special section. It's amazing. I can't describe it other than to say it's the closest thing to a synthesized bagpipe I've ever heard. The reverb is not programmable, but just having it on a unit this cheap is great. It's a bit noisy, and you may wish for a noise gate if you're running really breathy sounds through a long decay setting. Still, it's a welcome addition. The drum sounds appear to suffer from undersampling. You have to crank up the levels to get a good, solid thwack out of them. Of course, this also raises the noise floor to annoying levels. The range of sounds, though, is good, with both kit sounds as well as Latin instruments. There's lots of potential for the hitting-minded. I must stress that this unit is not programmable from the front panel. Unless you buy or write an editor, you'll have to live with the presets—so listen carefully before you buy. I've had my MT-32 for just over a year now, and I can heartily recommend it to anyone who already owns a MIDI keyboard—almost any MIDI keyboard. Although you can't do front panel editing, you'll be able to get at most of the sounds even from a preset-channel keyboard. However, the real power goes to those people who have multichannel master keyboards. These people will quickly learn of the joy and frustration of having to figure out which of the great timbres you're going to put where. The performance possibilities are nearly endless. A sequencer will let you do amazing things with this module. Because it's got 30 percussion sounds built in, as well as eight synthesizer channels and a theoretical ceiling of 32 simultaneous notes, it's possible to create incredibly complex music with just this one module. I recently had to move most of my stuff halfway across the country. I shipped off most of the equipment two weeks before I moved, but kept my computer and MT-32 until the last day. When a friend of mine visited to take a look at all of my equipment, I found that I was able to rearrange most of my demos to run solely on the MT-32 with a minimal loss of quality. In terms of cost and sheer musical potential, the MT-32 is the most powerful piece of musical equipment I own. Like its bigger brother (the D-50), the MT-32 uses an oscillator stacking system called Linear Arithmetic synthesis. Each voice can have between one and four partials assigned to it. Each partial is a complete synthesizer voice, with a single digital oscillator, filter, an amplifier and multipoint envelopes to control pitch, filter and amplitude. There are 32 oscillators assigned dynamically wherever they are needed. In order to calculate the amount of polyphony, divide 32 by the number of partials used in a voice. The thickest voices use four partials, equalling eight voice polyphony. Two is usually enough for warm, organic sounds. The oscillator wave may be either a square wave, a sawtooth or one of 128 PCM samples. Note that if you select a PCM sample, the filter becomes inoperative. You cannot filter a sampled waveform. There is good variety in the samples, with percussive sounds, attack transients and sustained loops. The envelopes are great. The only flaw in them is that, after creating a complex attack contour with three levels and four times, all you have left is a sustain segment, and then a single release time. Being able to create complex release segments would have been nice. Still it's a big improvement over ADSR. The filter and the envelope have programmable bias points with adjustable roll-off slopes. That means you can set up a partial to be active only in one area of the keyboard. If you set things up drastically enough, you could create virtual splits—without having a splittable master keyboard. With four possible partials per voice, and about 100 parameters per partial, it may be just as well that you need a computer-based editor to create your own sounds. There are a number of ST-based editors for the MT-32 (one of which is reviewed elsewhere in this issue]. Check your music store. Earlier on I mentioned a hardware/operating system quirk. Here it is. Although you can program your own sounds into the 64-program RAM area, you can't load up a bank of custom sounds and hit the road: You see, Roland didn't include a battery backup for RAM. What it did include was all the circuitry for a battery, and even a holder for the actual cell. But wait! Roland's only kidding! What it did was write the operating system so that the RAM would be wiped on power-down, and then overwritten by the ROM patches when you power up again. A technician at Roland told me that this was to make the unit easier to operate for the home user. I'm not sure I follow the logic. Anybody with enough MIDI smarts to buy an editor, create or modify some sounds, and then send them back to the MT-32 is not going to be flustered when, on power-up, the default bank of sounds is mysteriously absent. Furthermore, the sounds in RAM can only be accessed by a MIDI program-change command. Anybody bright enough to handle MIDI-sent program changes should also be able to deal with an absence of defaulted presets. The small footprint of the MT-32 makes it ideal for desktop situations. The front panel looks nice, and all cables stay plugged in neatly behind the unit. Because I already own a mixing board, I found the absence of a headphone jack only a minor frustration. However, it's an important factor to consider if you don't have a board and don't plan to run the unit through a home amp. My complaints are all minor however. Most of them are taken care of in the D-110, a fully professional, industrial implementation of the same basic circuitry. Of course, it also carries a correspondingly higher price tag. I am more than satisfied with the MT-32. It's an excellent starter or expander synth for amateur and semiprofessional users. Pound for pound and dollar for dollar, the MT-32 may be the best value on the synth market today.